My darling husband is typically a clean-shaven man. Several weeks ago, he didn't shave for a day, then two, then three, at which point he decided to see how long he could let his facial hair grow before he couldn't stand it. When the blessed day finally arrived, he indulged in an old-fashioned shave, an age-old luxury to the common man. 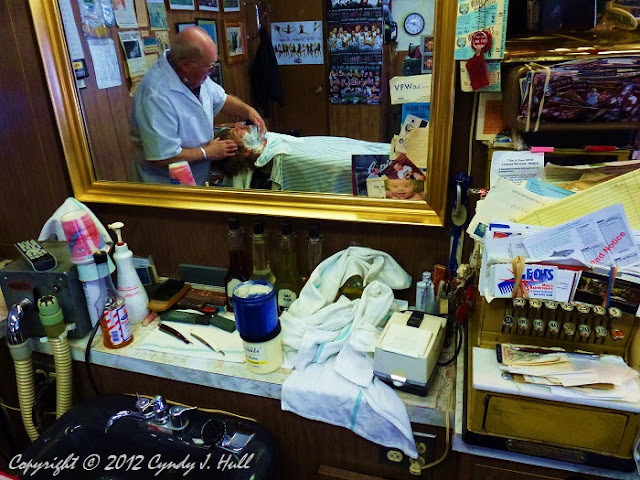 Steve at Capital Barber Shop has been delivering the works with chutzpah and old-time barber shop flair for over 40 years. There were hot towels, heated foam, straight-edge razors, man-cave acoutrements on the walls - just like in the old movies, with a little more attitude. My husband emerged relaxed and smooth - except for the mustache and soul patch our daughter decided he should try for fun. The 'stache lasted only a few days, the soul patch a couple more - and he once again looks like his handsome self, instead of like Jeff Foxworthy's brother.